The Kirkwood-Cohansey aquifer is a vast underground reservoir containing some 17 trillion gallons of fresh water in southern New Jersey. It is a shallow, unconfined or “water table” aquifer meaning that the water in the ground is just below the land’s surface in most areas. Most water in wetlands, lakes, streams, and rivers in southern New Jersey is water that seeps or flows directly from the ground from the Kirkwood-Cohansey aquifer. By supplying the water that flows through its rivers and streams, the aquifer also provides critical, fresh water to coastal estuaries, like Barnegat Bay, and to the Delaware River and Delaware Bay. Rivers that flow into the Atlantic Coast estuaries from the Kirkwood-Cohansey aquifer include the Mullica River, Great Egg Harbor River, Oyster Creek and dozens more. The Rancocas Creek gathers water from a broad area and flows into the Delaware River above Philadelphia and Camden. The Maurice and Cohansey Rivers flow south from the aquifer into Delaware Bay. In these ways, the aquifer sustains water supply and ecosystems far beyond its own boundary. Because it is so shallow, it is easily polluted by fertilizers, herbicides, pesticides and chemicals that are spread or spilled on the ground’s surface. Also, over-pumping or excessive withdrawals of fresh water harms wetlands and unique plant and animal species that rely on the special characteristics of pure Kirkwood-Cohansey water. Explore the Interactive Aquifer to see the effect of water overuse and impact of pollutants on groundwater in the aquifer. There are eight aquifers in southern New Jersey that provide about 75 percent of all fresh water used in homes, businesses, and for farming. The Kirkwood-Cohansey aquifer is comprised of what are known as the Kirkwood and Cohansey geologic formations, which include underground, water-saturated layers of sand, fine gravel and some clay-like material. 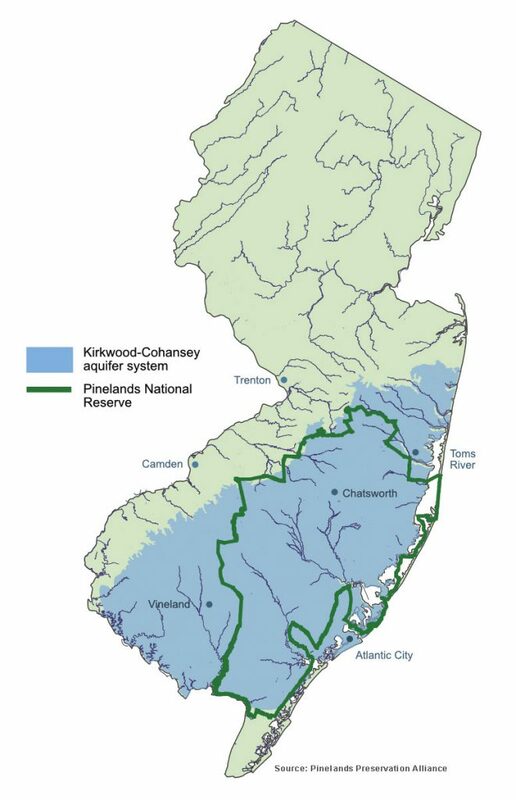 In some areas the Kirkwood-Cohansey aquifer is connected to deeper aquifers like the Atlantic City 800-foot sand aquifer, which is close to coastal areas and a primary source of drinking water for Jersey shore communities. Confining layers, comprised of an impermeable clay-like material, separate aquifers and prevent or inhibit water from moving from one aquifer to another.